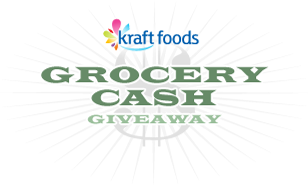 Go here to play The Grocery Cash Giveaway! Just fill out your information and spin the wheel to see if you will win a prize. One Grand Prize winner will win $1,000 cash! You could also win $100 cash, $25 cash, a coupon for FREE Philadelphia Cream Cheese, or a coupon for FREE 16 oz. Kraft Pourable Salad Dressing! You can play the game once a day through November 6, 2009. Every time you play, you get another entry toward the Grand Prize!